This past year was not about riding. It was about recovering. As long-time readers know, I have faced a number of physical challenges over the last couple of years. For a time, I had no idea what the problem was. It was not until surgery this past January that I learned about my injury. I continued to learn things throughout the year about how my body, and how my post-surgery hip. 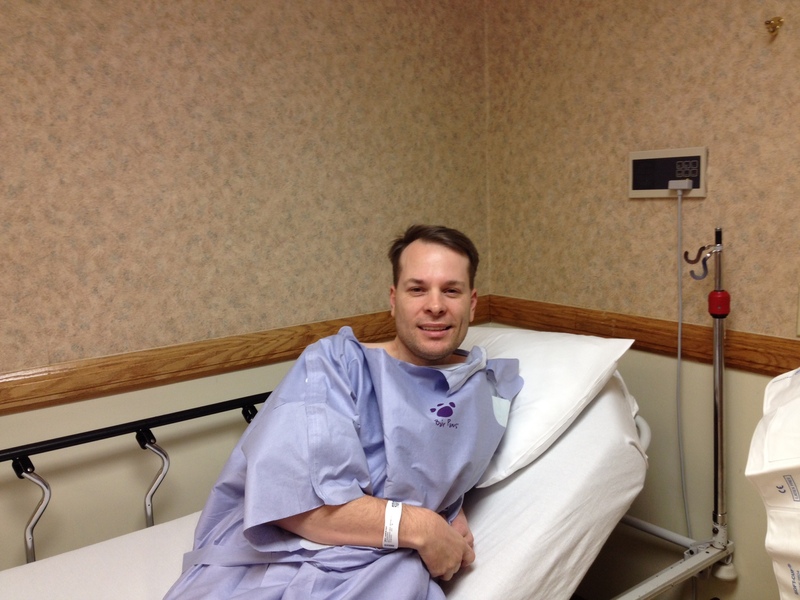 Prior to having surgery in January. What I didn’t do much was ride my bike. 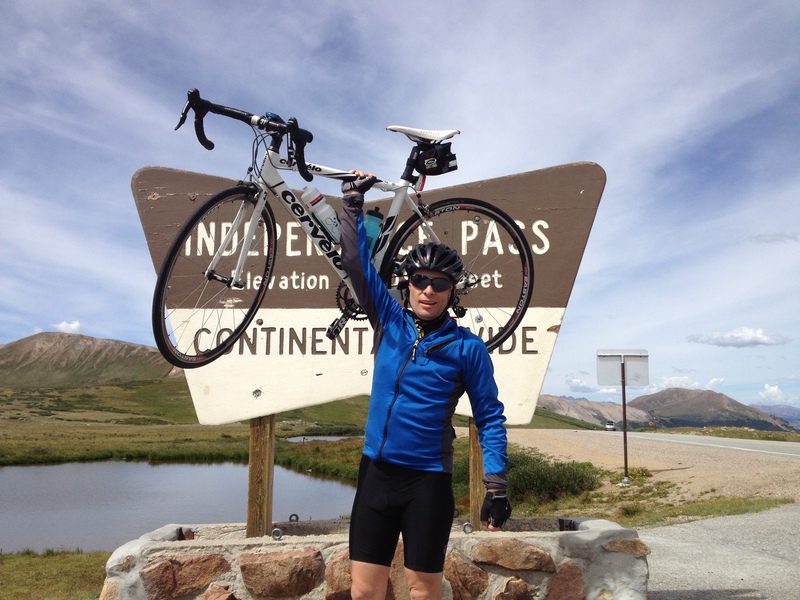 As I began to heal from surgery and progress with physical therapy, I gave riding a try during the summer. While I still had plenty of memory in my muscles and had retained some fitness, I wasn’t quite ready. My hip had not healed enough. I shut it down and it has been over six months since I was last on the bike. And that’s about it. ‘Nuff said. The best part of the year happened in February in my third week after surgery. My wife had been trying out for Jeopardy for nearly two years. She finally got the call to appear in early January. Her episodes would tape in February. The worst part was the timing. I was going to have surgery on January 31st, and initially I wasn’t even sure whether I could attend. My doctor helped me with that part. I attended and watched her triumph in one game, and then come in second place for the next game. I was so proud of her and it was the experience of a lifetime, even if the experience was physically painful and clouded by painkillers. I’ll still never forget it. The tough part was not being able to say anything for about five months. I wrote this “VICTORY” post ahead of time, and scheduled it to publish after her episode had aired. We had a fantastic viewing party where many of our friends and family celebrated with us. She received a good bit of media coverage, which was something new to us, but it died down. I was extremely proud of her, and let her use this platform to talk about her experience. 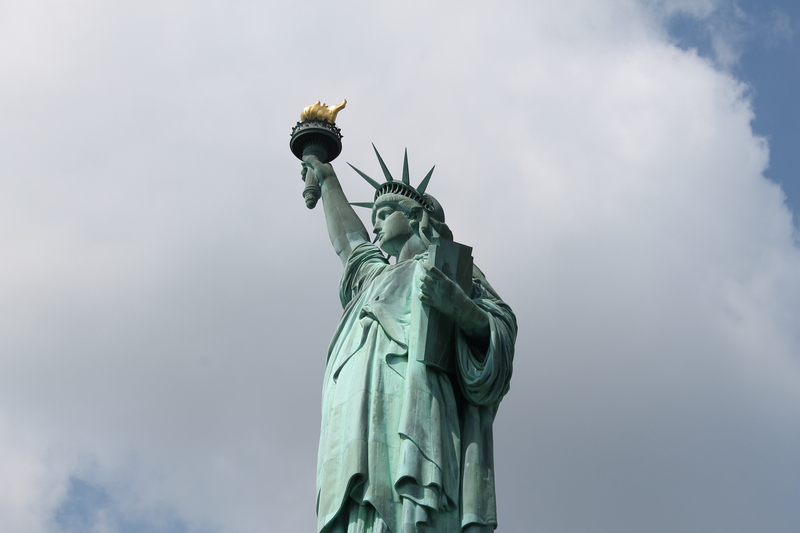 We celebrated with a trip to New York City, which believe it or not was my first trip to the city. The trip consisted mostly of us doing tourist things, eating, drinking, and having a great time. Not only did we have a great time, but this was the first major breakthrough in my injury recovery. At first I was nervous that I would not be mobile enough to enjoy the city. You really have to walk to enjoy New York. I gave it a go and had trouble early on, and then almost miraculously, I felt fine. We walked, walked some more, and then continued walking. The next major event was something that I’ve never really talked about here. Some would find it surprising that I’ve been a part-time student for the entire lifetime of this blog. As I touched on during some of my autobiographical posts earlier this year, I had some professional distractions. I had a company, sold it, and then landed a good job in a new career years later. This is hard to believe, but I have been in college, off-and-on, for 21 years. I began this year close to graduating, but figured it would be sometime in mid-2015. Surgery turned out to be a blessing because I had a lot of free time during the first part of the year. I was able to occupy my time by taking remote or online classes in the spring semester. My professors were all understanding, and they gave me a breather for the first few weeks. Even though I wasn’t at my sharpest, I still managed to do well in those classes, and by the end of the semester, I was within sniffing distance of graduating. All I needed was one class. I waited for a class that I would like, and that ended up being a Fall graduate class about a subject that I enjoyed. The class was difficult and consumed a lot of my time, while a busy year at work consumed the rest. This was part of the reason posting slowed here at SteepClimbs (and also because I was not riding). Even though the last few months were among the busiest of my academic career, I finished and graduated just a couple weeks ago. 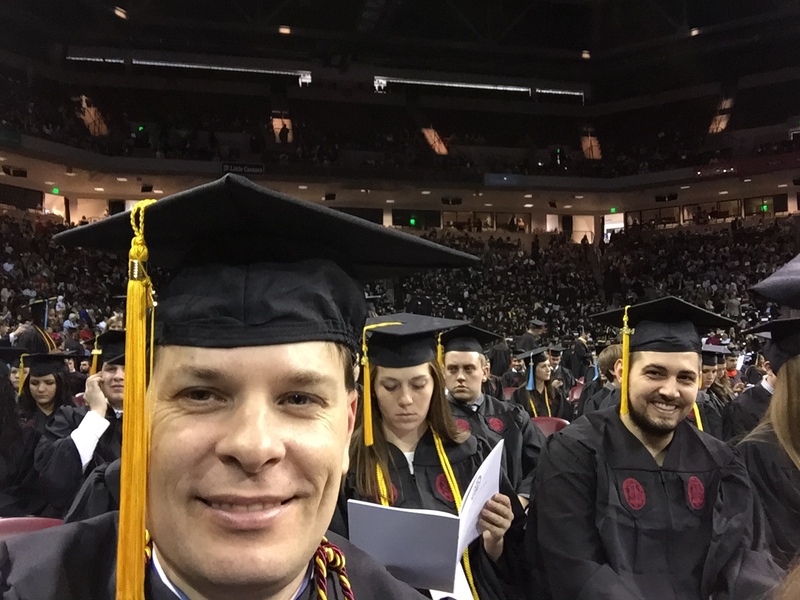 The picture above was a selfie taken with 2,800 other graduates. The graduating class went up to the green light that you can see above my cap. The bearded smiling guy on the right gave me a photobomb, but he was a good sport. He could have done much worse! Graduating itself was pretty awesome, but even better was being able to walk without assistance or pain. I had made a lot of progress during the year and it felt great. I walked to the podium with a wide smile on my face as I shook hands with the school president and dean. 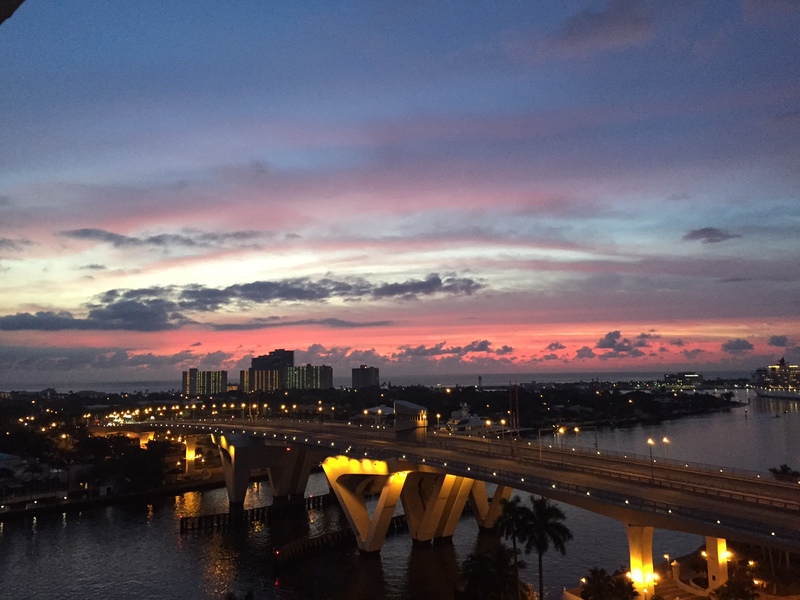 We celebrated graduation with a trip to South Florida. The pictures above were from this past Saturday morning. I woke up early to see an incredible sunrise. 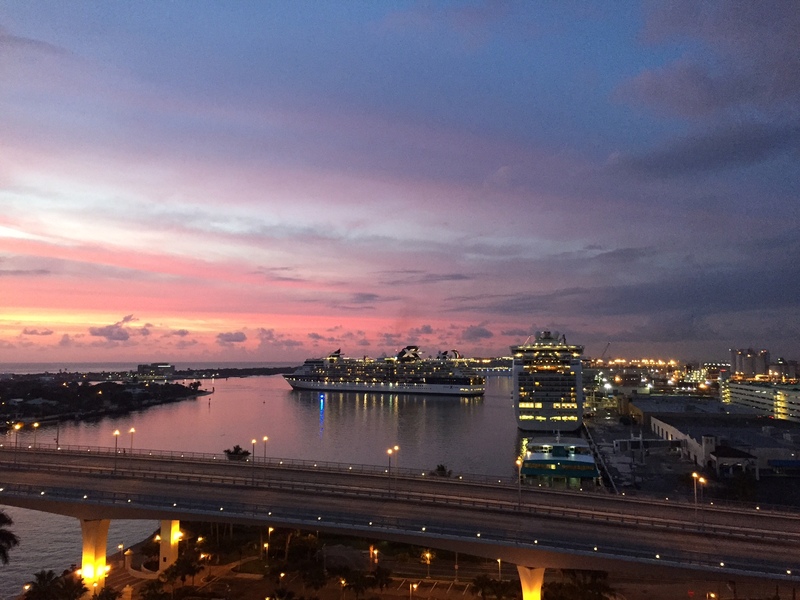 Our hotel overlooked the Fort Lauderdale Harbor. The cruise ships were all returning from sea and they added to the gorgeous view. My physical challenges are not completely out of the way. I’m still recovering from the injury. It looked initially like this would be a 12-month recovery, but it will most likely be a 12-16 month recovery. It is far better than it was, and most days I have no problem, but it is sensitive to cold weather. That was one of the reasons we went down south for a vacation. The warm weather makes a huge difference. While there, we walked again, just like in New York City. We probably walked about 50 miles in total and the hip felt great. Even though I’ve been recovering from a rough hip injury, it has been a fantastic year! It is difficult to predict what will happen in 2015. I know that some great things will happen. I’m on pace to hopefully be fully recovered when the weather warms up in the spring. That should allow me to return to the bike once and for all, and then slowly rebuild my fitness. We already have plans to return to New York City in June, and hopefully I’ll be able to ride there a little bit. Without school occupying my time, I’ll be able to dedicate myself more to fitness and continued rehabilitation. I’ve already joined a New Years Plank Challenge, which should help get my core back in shape. I’ll continue walking and might even try running as long as the weather and my hip allows. There’s a good chance I’ll climb again in 2015. It could happen, right? If not this year, then the next. I’ll be surely and slowly working toward that goal, and one day I will get there. Thanks for following along. Thanks for all of the words of encouragement and support. I hope you all had a tremendous 2014 and will have an even better 2015. It has been a little while since I’ve checked in. It is hard to believe that the injury first occurred over two years ago. Finally I am able to live life and stay relatively active without pain, and after this messy ordeal, that’s a good thing. I’ve been reluctant to jump back onto the bike until I’m sure of having no setbacks, so instead I’ve been doing a whole lot of walking. Most of the time walking is not exactly interesting (with some exceptions, like a gator story I might tell someday), so the blog has remained dormant for the time being. Fortunately I found a walk that’s extremely interesting and highly personal, so I thought I would share. 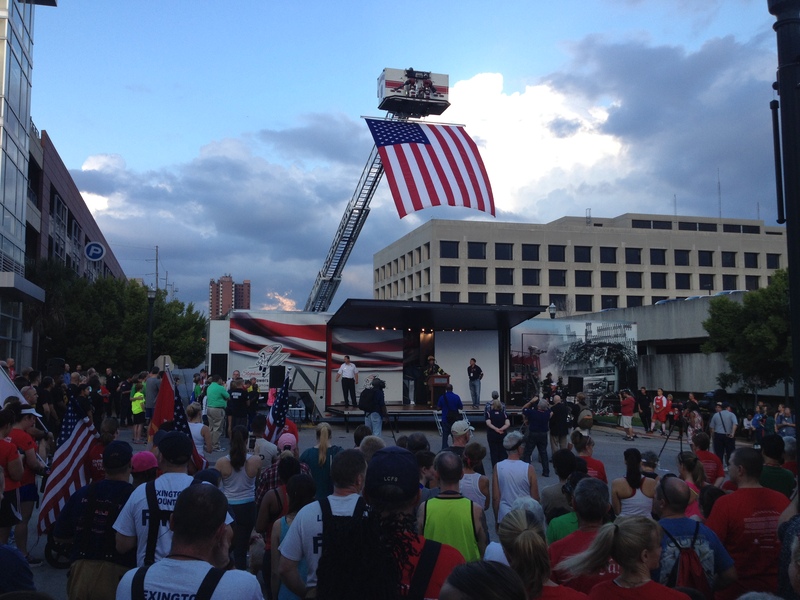 Last week I heard about a 5k run to commemorate firefighters who passed during 9/11. 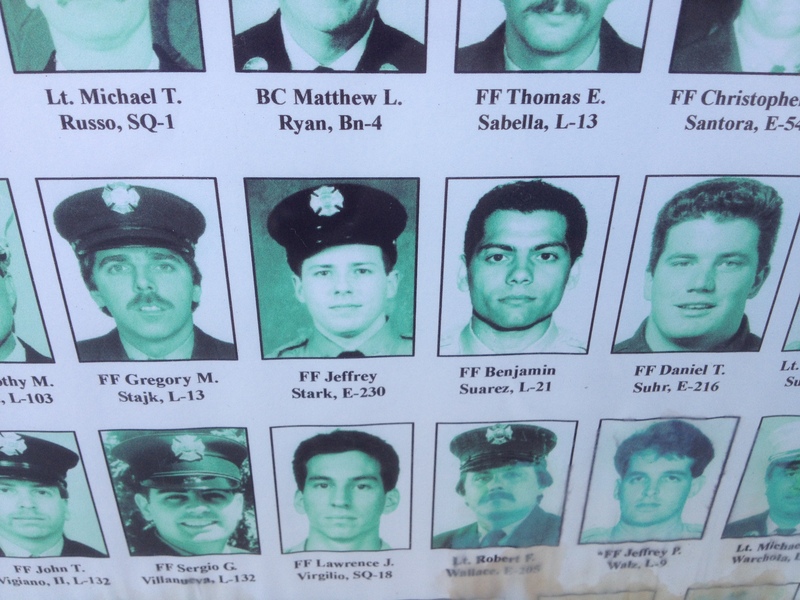 Tunnel to Towers is specifically designed to honor the sacrifice of Stephen Siller, who ran from the Lincoln Tunnel to the twin towers in full, heavy firefighting gear. He is a true hero and is worthy of being honored. Yet, for some reason, I hadn’t heard about this event. Let me backtrack a little bit here. 9/11 is the day in our generation that everyone remembers vividly, sort of like the Kennedy assassination for the baby boomers. I was working from home and didn’t have the TV on. I left to grab some breakfast around mid-morning, and when I ordered, someone at the counter said “Can you belief that we’re under attack?” The first plane had just hit the tower. I rushed home and watched the news and kept it on for hours, shocked and saddened by the tragic events as they happened. Later in the day I visited my family. I have three younger half-siblings, and they were much younger then. The oldest was 10. They came from my father’s second marriage to a nice lady from Staten Island, NY. This was the ideal step-mother situation, as we got along splendidly nearly from the first time we met. Today I consider her to be a part of the family. She had three brothers who were all firefighters. One of them was even a Battalion Chief. When we learned that the towers had collapsed and firemen were down there, she was worried that her brothers might have been caught in the wreckage. She made phone call after phone call, trying to account for their whereabouts. She got in touch with two of them, but neither had heard from Jeff, her youngest brother. The night passed, and in the days following, she continued making phone calls trying to find him, to no avail. She heard from her brother that his unit was one of the first in there, and it looked grim. Jeff didn’t make it. We’ll never know what happened, but we do know that he passed away while saving lives, just like Stephen Siller did. Here is a little more about him. I had never met Jeff, but because of what happened, I felt like I knew him. He was a young buck, in his mid-twenties, a good boyfriend to his girlfriend who was going to law school, and he and my step-mother were very close. He was a guy I would have liked to have met, and probably would have if that tragic day had never occurred. It was tough on the kids. They knew Jeff and loved him. I did what I could to comfort them, but they didn’t truly understand. Since then, the thought of Jeff and the memory of the grieving family has dominated my memories of that tragic day. It’s strange how people react, and I’m not an outwardly emotional person. I hardly ever cry in movies for example, but for awhile, anything 9/11 would strike a chord with me. I avoided movies and documentaries about the subject just because of how painful those memories were. Time has a way of making things easier. When we visited the 9/11 museum, I made it a point to look at the memorial for Jeff. There were audio recordings from his mother, my step-grandmother, who I have met several times and is a sweet, dear person. It was touching to hear such a familiar voice talk fondly about her lost son. 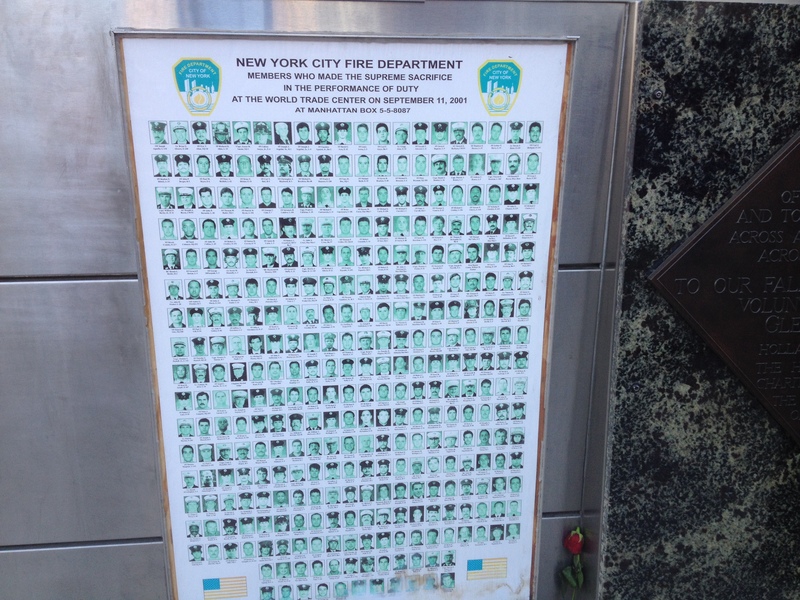 One day we accidentally walked by the NYFD and stumbled upon images of all the lost firefighters. Jeff was in the picture. So when I heard about the 5k, I jumped at the chance. The crowd was massive. 5k strong! 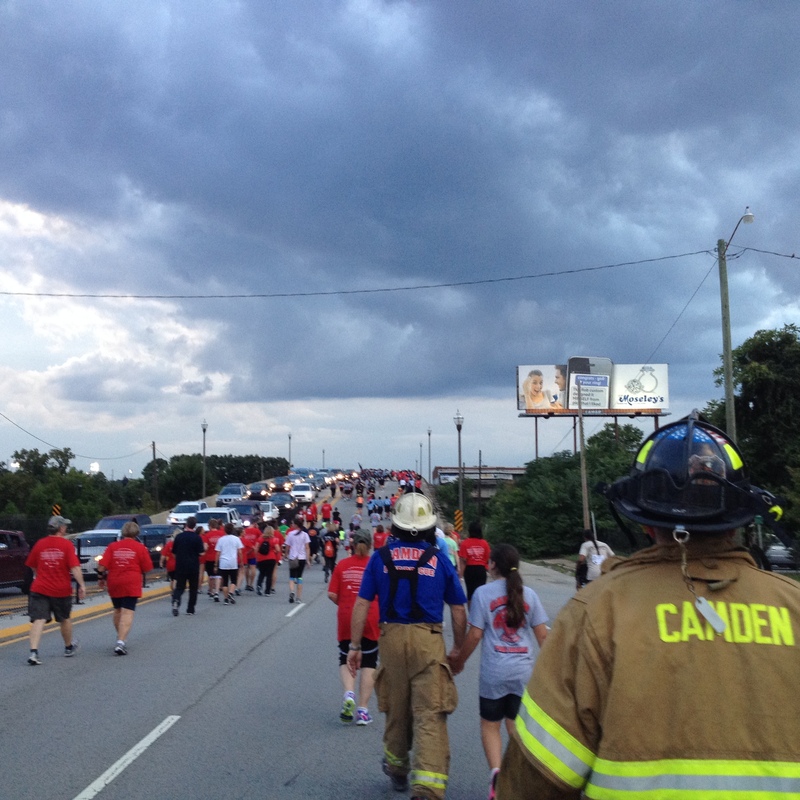 Even though I’ve been walking for exercise, I was reluctant to sign up for a 5k. Sometimes my own worst enemy is myself and my competitive drive. If I start at a race with the intention of walking or jogging slowly, I may change my mind when people start passing me. This one was safe for a number of reasons. First off, it was massive. 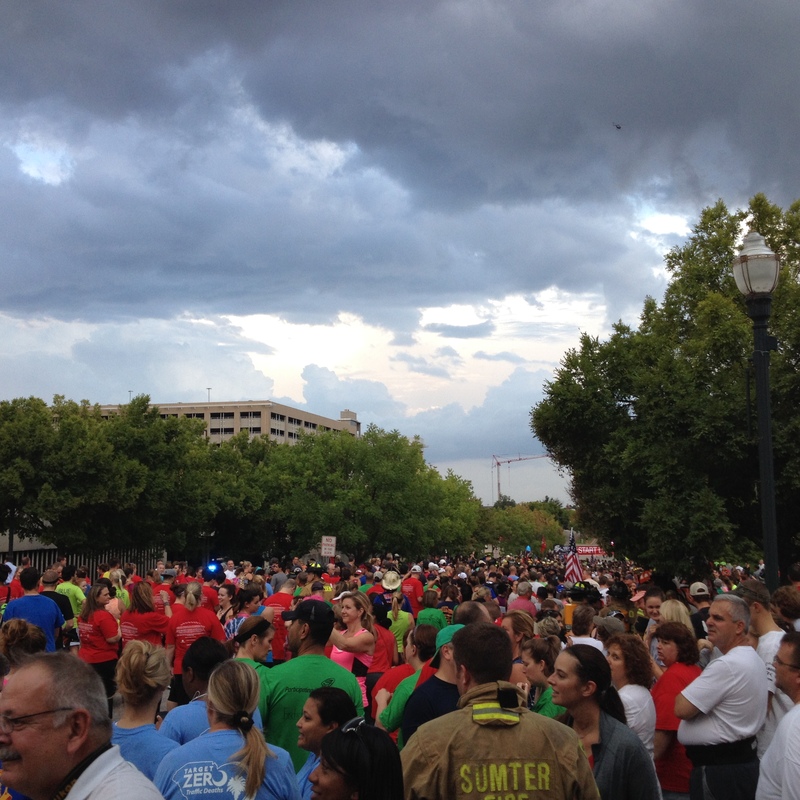 Approximately 5,000 people participated, and many of them walked. Second, part of the thrill of the event was the camaraderie and the tribute. I was able to experience plenty while walking around and looking around than if I had run. Still, I was nervous and I prepared to go slowly. As I began to walk, groups of marching military groups would pass by. 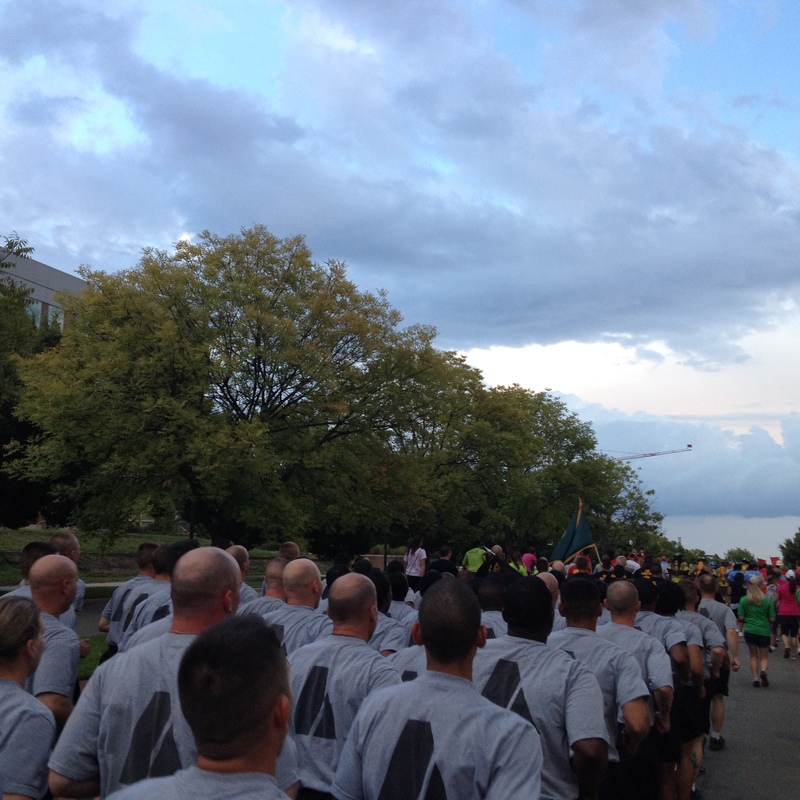 At first they walked, and as they got to the starting line, they would jog. They kept a call and response cadence, some of which were serious, others fun and lighthearted. I felt privileged to walk among them. The most special event came a short while later. As we made a turn, we saw a line of people holding up pictures. I immediately recognized them from the NYFD. 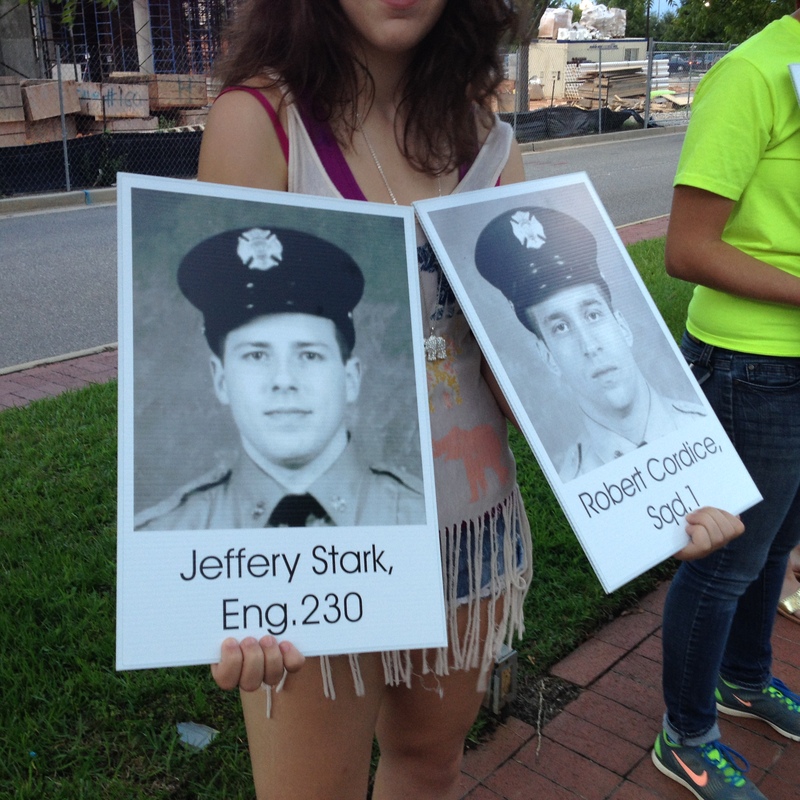 I made my way across the street between the marching military columns and looked at each of the signs in order to pay tribute. Then lo and behold, Jeff’s face showed up. I stood dead in my tracks. “That’s my uncle-in-law!” I shouted to the nice young lady. I was moved and even choked up when I saw him there. I asked if she would pose for a picture, and of course she obliged. Later I found out that these were all USC students who stood out there holding the signs. Thank you, students. As I continued walking, I made it a point to look at every other sign. I could only afford a quick glance at each, but that was enough. These firefighters were all heroes, and they all had families like mine. Another benefit of walking was I was able to share pavement with many of the firefighters who were walking in full, heavy gear. I cannot imagine how difficult it was to walk with them. As I passed them, I made sure to let them know how much I respected what they were doing. Along the entire course were onlookers cheering us on, giving us high fives as we passed. Many of them carried American flags, and they contributed to both the excitement and the patriotism of the event. Even though we were paying tribute to a tragic event in history, the mood was jubilant, patriotic and everyone was full of resolve. The time for mourning has passed. We were celebrating their heroism. I found out later that someone had officially run for Jeff in the New York event of this race. Next year I will make it a point to officially run for Jeff here. And next time I will run. New York City is arguably one of the best bike cities in the country. People bike everywhere, and it’s a great way to see the city without putting too much wear and tear on your feet. While the city can be tricky to navigate and drivers are aggressive, with a little research and safety precautions, it is a great place to ride. Or so I’ve heard and seen. I didn’t ride at all in New York, as tempting as that was. As a cyclist, I observed a lot. That made it tough to stay off of wheels, and there were a couple times I considered either renting a bike or grabbing a Citi bike, but I exercised caution rather than risk hurting myself and ruining the vacation. This post is just about the biking that I saw during this vacation. This cop was on it! We saw bike lanes practically everywhere in New York. At first I cringed seeing riders ‘sharing’ the road with aggressive taxi and Uber drivers, not to mention dodging walkers and dealing with traffic. I could tell that riding in Manhattan is not for the squeamish if you ride surface roads along with cars. There are plenty of isolated lanes that allow for a more safe and quiet ride, but those are generally scenic areas and not necessarily a way to get from point A to point B. One of the coolest things I saw was while walking not far from the United Nations. There were a lot of bike lanes in that area, but as usual in NYC, not much parking. We walked along a road where three cars were idling in the bike lane, using it as a parking place. We thought nothing of it until we heard yelling behind us. Our heads snapped around and we saw that it was a cop, and he was yelling with authority. We almost stopped in our tracks, wanting to watch the human drama that was about to take place. Instead we walked slowly and inconspicuously as we saw this police officer yell at the first guy. He swaggered up to the car and handed the first guy a ticket. The guy protested, tried to give an excuse, and he didn’t even listen. He then was upon the 2nd car, also delivered a ticket. By this time our slow walk had placed us in front of all three cars, and we saw the driver of the 3rd car looking concerned through his rear view mirror. Bam! The officer ticketed the 3rd guy. The entire thing took place in about two minutes, and I was lucky to catch a picture of the final ticket. I don’t know this officer’s name, but he immediately became my hero. People better not park in the bike lane on his watch! When I hear or see something in the news about a cycling incident (usually an accident, and unfortunately sometimes a fatality), a lot of people point the finger back at cyclists for not obeying traffic lights. Stephen Pastis even twerked us in his Pearls Before Swine article by saying we are above everyone and allowed to do this. The truth is that most that cycle for sport are extremely safety conscious and they obey traffic laws. I pride myself on riding like a car would. The gray area is stop signs, which we will coast through without putting the foot down, but we first make sure that passage is safe. Essentially that is a stop because we are going slow enough to see danger in the area, but unclipping and putting the foot down, and then having to clip back in slows us down and makes it take longer for us to get through the intersection, which is a different type of danger. 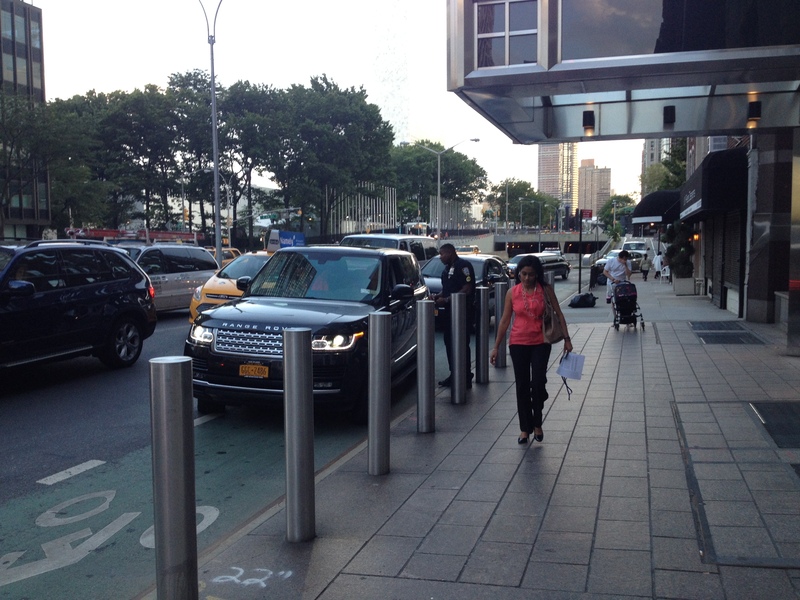 Many of the traffic laws in New York are out the window for bikes and pedestrians. If the coast is clear, we walk or pedal through the intersection, red light or not. The cars will stop, but that’s because they would get a ticket otherwise and there are police everywhere. The law looks the other way with walkers and bicyclists. That’s all well and good, but I saw some people doing very dumb things on a bike. Usually these were locals or tourists. There was one time I saw a bike dart out into an intersection where I had already stopped because I saw three cars coming. He didn’t see them, and for a split second I thought I was going to witness a horrific accident. Instead he turned the wheel towards the right once he saw the cars. I still thought he was going to get hurt, just not as bad, and then he kept on turning. He did a U-turn right in front of us, and was fine. Mad props to him for his reaction, but I guess you learn survival instincts while biking in New York. 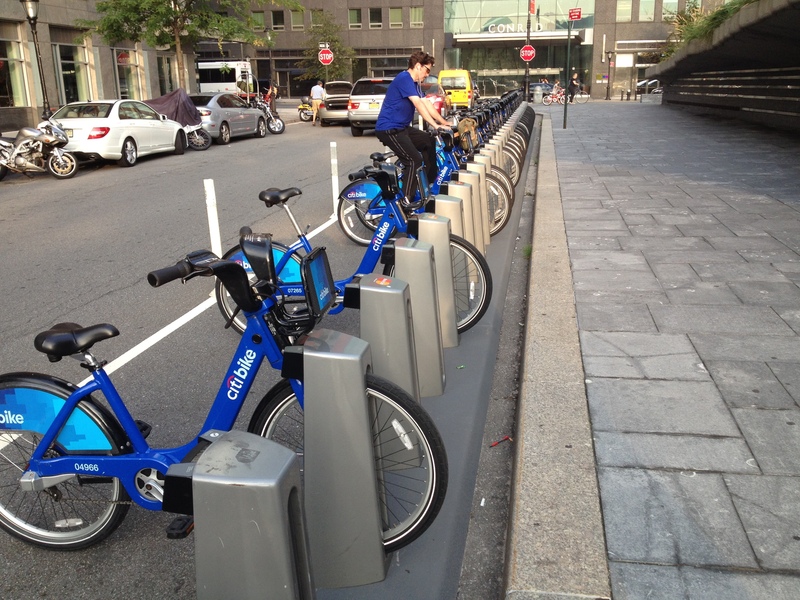 At many major intersections, we saw rows of the familiar blue bikes from the Citi program. We saw people riding them often. The program has to be a huge success, and it really makes sense for Manhattan where many people do not drive (we didn’t either). These riders were mostly tourists, and a lot of them did not wear helmets, but they also tended to ride in safer areas like Battery Park City and across the Brooklyn Bridge. This was the biggest temptation to me, and I almost pulled the trigger on a Citi bike to ride over the Brooklyn Bridge on my last day in town, but I passed. The worst case scenario would be that I would flare up my scar tissue injuries and have a miserable flight back. There wasn’t a good chance of that, but I still didn’t want to risk it. One of the funniest sights we saw during our trip was someone using the Citi Bike as an exercise bike. He even had headphones on and everything. Most people, myself included, would far prefer to ride in scenery than in one place, especially along the Hudson River, which was where this guy was riding. Not to mention, the bikes are relatively inexpensive. This was a kid, so maybe they were expensive for him. Either way, we got a good laugh and I hope he got a good workout. Riders were all over the place in Central Park. This was the toughest temptation for me. 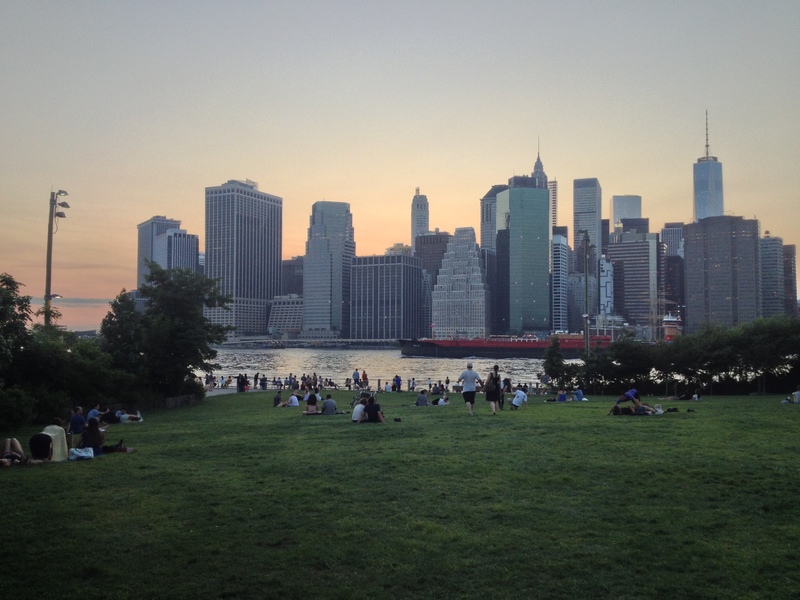 We visited Central Park twice, one day from the west side and the other from the east side. We were bombarded by people trying to rent bikes when we got off the subway. When we got into the park, we understood why. There were bike lanes and bikes everywhere. As we navigated through on foot, we were only able to see a small portion of the park, and even that little exhausted us. I’m the type of person that likes to explore and see everything, so it felt wrong to pack up and leave without seeing the main park attractions like the reservoir or Strawberry Fields. Just because we were in the park, didn’t mean that bikers were any less aggressive. This time we had to watch out for them when walking around. There was one time that I was crossing the street when all of a sudden a road cyclist was darting right towards me. I stopped in my tracks. He nodded to motion that he would take the inside lane, and I was able to continue crossing. 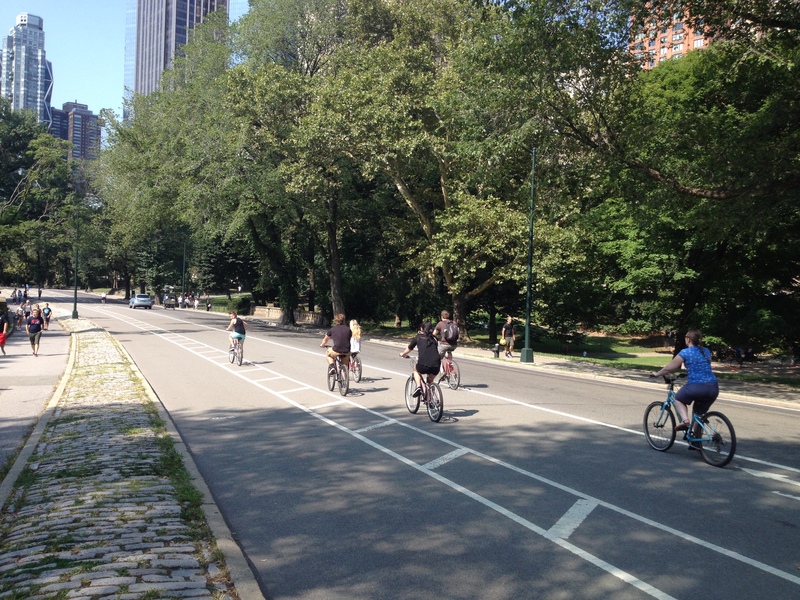 Just like in downtown Manhattan, the Central Park cyclists have built-in instincts on how to get around safely. Even though I wasn’t able to cycle, I walked dozens of miles and the hip held out, so I should not be too disappointed. That said, I love to ride and that’s one of the major attractions for going to New York City. No worries because we loved the city so much that we’ll definitely be back again. I’ll make sure that next time I’ll be healthy enough to ride, and Central Park will be at the top of my wish list. 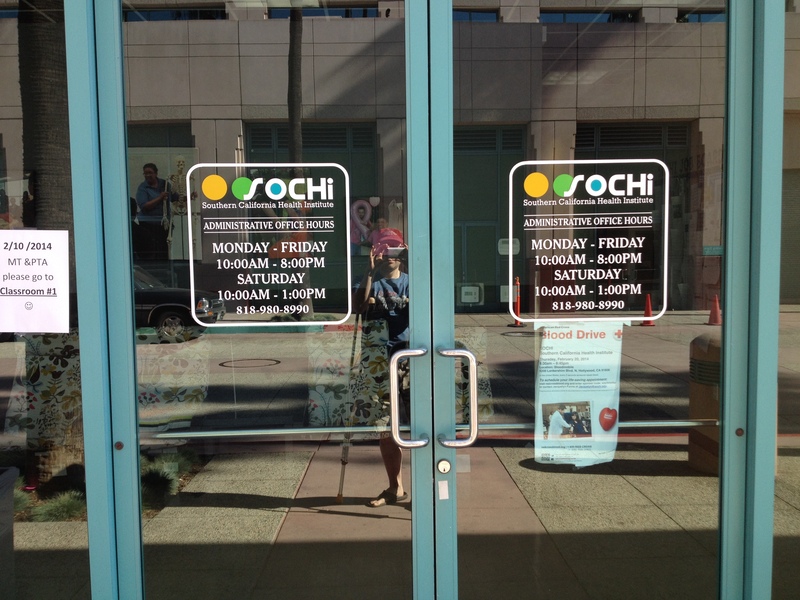 The front door to the old office, right around the corner from my apartment. In June of 2000, I traveled cross-country by car, with a cat and all the belongings I could bring, to arrive at my new life in North Hollywood. 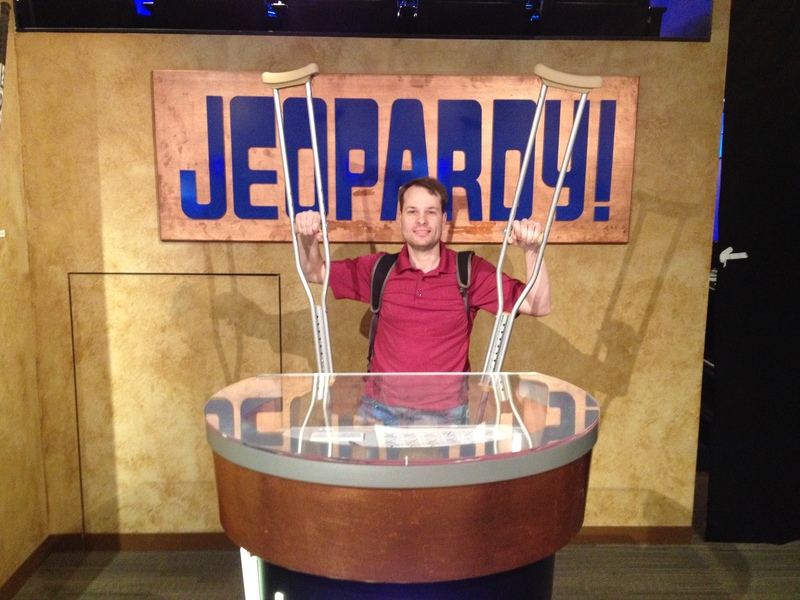 Just before my wife’s Jeopardy appearance, we arrived there again, this time with a rented Nissan having flown for 5-hours. We hopped on the 405, drove by a lot of familiar sights like the Getty Museum, then jumped onto the 101 and made the slow drive to my old home. We made our way to the intersection of Magnolia and Lankershim in North Hollywood, which was the center of my universe during my entire time in southern California. The buildings all looked the same, but the names had changed. 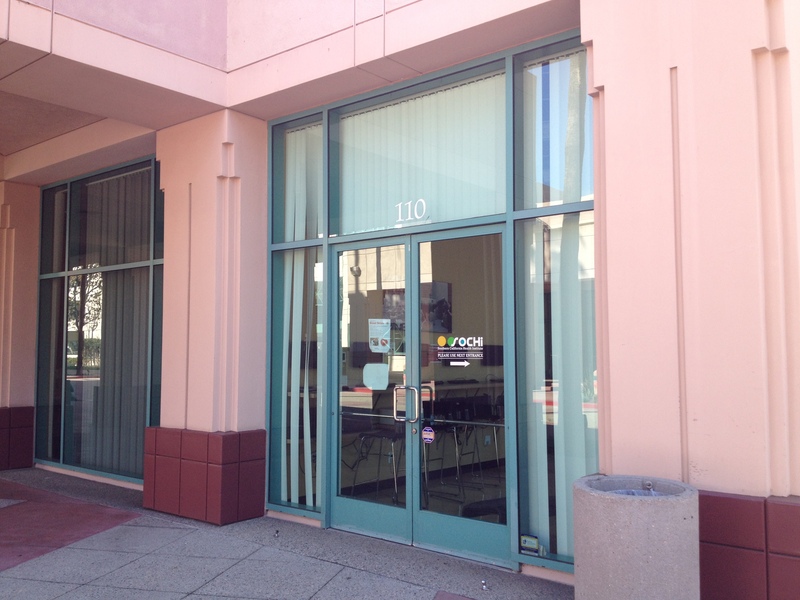 What had been my former and employer is now a health clinic. I peered through the windows to see where my old desk was, and all I saw were cubes where people were screened for health problems. The building across from my old employer was still there. It had formerly been ABC, and now is The Africa Channel. 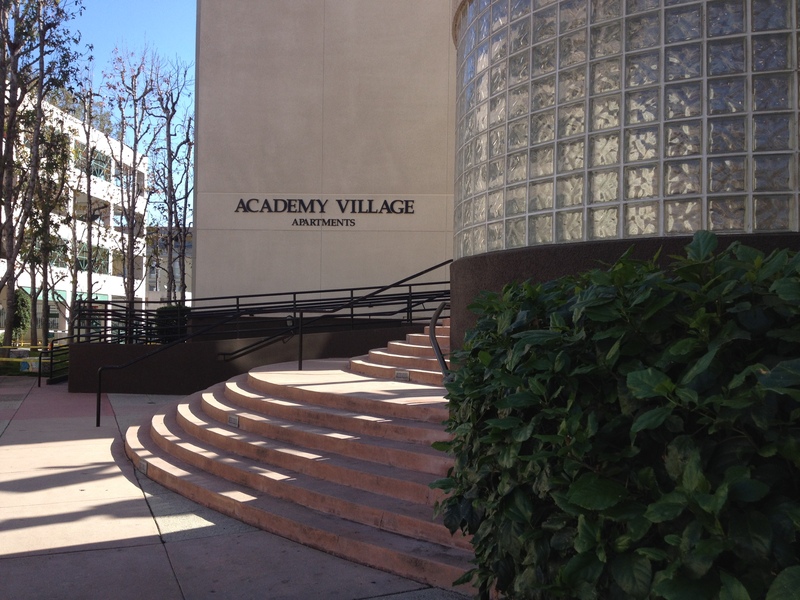 The Emmy Academy and my old apartment complex, Academy Village, were still there and looked unchanged. There was still a Starbucks across the street, which was where we had a lot of employee meetings, and sometimes we went there just because. I bought a lot of coffee that year. That’s where I sat, and yes, that’s me in the reflection too. Even though I had gained some age and experience, I was still young and naive. That’s a recurring theme in this entire saga, making a poor decision but working hard enough to make it a success, while relying on a little luck as well. Even though I had negotiated what was a good salary for Atlanta, it wasn’t as good for California. Nevertheless, I went for the nice apartment at the Academy Village. It was conveniently almost directly upstairs from my employer. What I spent on coffee, I saved on gas money. This was right outside where they held the Emmy awards. I remember one year looking out of my balcony and seeing The Sopranos all standing outside in suits. The apartment complex of the Emmys. My new employers also made some poor decisions. Unlike the other properties they purchased, they were mostly interested in my content to essentially build the same thing on their home site. From almost day one, they redirected traffic from my old site to theirs, and lost a lot of it in the process. Previously people had reached our network from deep links such as tutorials or product reviews. They redirected all of that to the home page, and people gave up. We also had stopped producing new content during the prior two months or so during this transition, so the traffic had diminished by the time the site was redirected. My title was Content Manager, and I was given a staff of about five employees. They were mostly writers that had a little bit of a web background. They were good for me since I came from a different background. I spoke the language of the web and had become a decent writer, but I had no formal training whatsoever. I remember the first day a guy with an English Master’s degree playfully making fun of my writing. I learned as much (if not more) from them as they did from me. Together we moved all of my old content to this new company’s website. We built it from scratch and divided it into different content areas. We also incorporated some of my friend Michael’s search engine and marketing content, and he helped write some things for us. This gave the company some credibility, and they then licensed the content out to numerous affiliate sites. In an instant, me and my staff were everywhere on the web. For awhile, the company was successful. They were technically a startup, but had been funded from deep pockets and were in their second round of funding, which is what they used to buy me. After I had been there a number of months, the company had achieved profitability. That’s rare and not expected for a startup by that point. Their business plan was to get the third round of funding and then become profitable, so it was just a bonus that they made it to that level so much earlier. They made good decisions with their acquisitions. Some of the advertising sites and affiliate programs they had purchased had turned immediate profits, while ours was more of a slow build as we essentially re-built a webmaster’s network. After the properties were built and had a regular content cycle, they decided to promote me to Development Project Manager. This was another mistake on their end. I was completely a fish out of water, and I told them that. They had people that were programming in languages and databases that were entirely Greek to me. Instead of doing what I was comfortable with, which was more design-oriented and editorial, I was running a department that handled the backend. I remember when I first started in the position, I had to interview every developer to find out what they did. To be honest, I had no idea what they were telling me. I tried to listen as much as I could and make it seem like I understood, but I didn’t. The good thing is I didn’t manage to do much damage. I probably didn’t help them much either. Still, I knew that long-term, this was not the right avenue for me. This is where they hold the Emmy awards. Around this time I had heard murmurs of the market turning for technology. The 90s had been booming, with people like me (but not me) becoming rich overnight from insane IPO valuations. It was not sustainable, and eventually it caved in on itself. The dot-com bubble is legendary now, but aside from hearing the fear in people’s voices occasionally, we were mostly oblivious to what was happening. Mostly. I saw the writing on the wall, and I was in a job position that was not suited well for me. Adding to that, I wasn’t happy there. Sure, I loved Southern California and had some wonderful times, memories that I’ll never forget, but I did not have much aside from the job and my apartment. I had money, but not enough to live the lavish California lifestyle, and that wasn’t my speed anyway. I had left behind my social network, and while I had made new friends like Michael, most of the people in the new company were not too outgoing. I grew bored. After a year, I decided enough was enough. I spoke with my employers and asked them to reinstate me as Content Manager. I would move back to Atlanta and perform the job remotely. They weren’t thrilled, but I had an employment contract built into my acquisition, so they had to go along with it. I moved back to Atlanta, got an apartment, and did the job to the best of my ability. It wasn’t easy because communication technology wasn’t quite as sophisticated, and we were in different time zones. I may have helped a little bit, but the team mostly did the work by themselves. Their company was affected by the bubble bursting, and the deep pockets dried up. There would be no third round of funding, and they started trying to get out of the employment contracts. They fired one guy who sued and was able to keep his job. They got rid of a couple others. When they made the call to me, I knew it was coming, and I was fine with it. I did not put up a fight. I had another opportunity lurking (a book deal), some cash from the acquisition in the bank, and a lot of experience. I didn’t expect many headwinds in my future. We parted ways and they went out of business within the year. They sold their assets to a web hosting company. My stock became worthless, and that was fine too. Remember Paul and Amanda, my partners in crime? What was interesting is right about the time I was getting acquired, I was contacted to develop a site for the alternate band Weezer, who were still pretty popular at the time. Of course I couldn’t take the project, so I gave it to Amanda. She later got a job maintaining Humor.com and has been loosely tied to the industry ever since. We are still in touch, and my wife and her have connected on Facebook through their love of cats. The last I heard was that Paul works an IT job in Ohio. He’s absent on social media, so we really haven’t reconnected. Paul, if you’re out there, give me a shout. Thanks for enduring this diversion from the cycling and Jeopardy stories. I didn’t expect to write so much, but I did enjoy it. This chapter of my life was pretty interesting, although maybe (hopefully?) not as interesting as cycling to the top of the tallest mountains. Now, back to Jeopardy. My wife will appear a week from next Monday, but the show is in the can. I was out there, in pain, and have some more stories to tell. Andrea and I flew out a couple days early to Los Angeles for some downtime before her Jeopardy experience. We would need to recover from the stress (for Andrea) and pain (for me) of traveling, plus get adapted to the time difference. 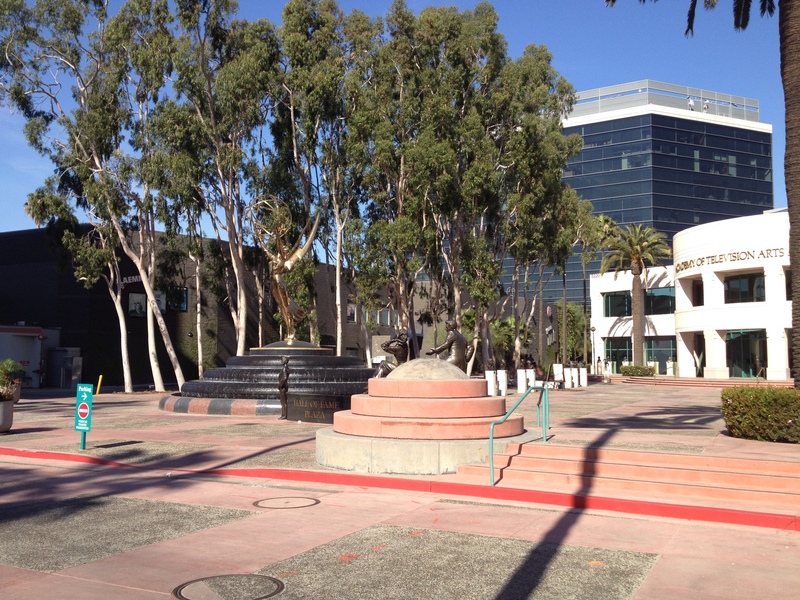 During the downtime, we decided to take a short trip to see my old stomping ground in North Hollywood, CA. Before the age of 30, I had sold a company and moved west. Today that seems like ancient history, and I wanted to show her my early life. Before I get to Southern California, I have to share the story of how I ended up there. It is a bigger story than I expected, which is why I am dividing this into two posts. I was not blessed with a college benefactor or scholarships, so I spent my early twenties working full-time at low-paying jobs while going to school part-time. The jobs may not have been ideal, but I made the best of them. This is where I developed work ethic, and had proudly been promoted in some way, shape or form, in all jobs after the age of 18. Going even further back to the 1980s, at a young age, I had delved into computers. When we lived in San Francisco, my father was an early member of the Berkeley Mac Users Group, frequented by Steve Jobs and other early Apple figures. My first computer was an Apple II, which had a floppy and tape drive. Yes, that is tape as in cassette. I remember that if we wanted to play a game, we had to load tape after tape into the computer for a couple hours before it would be ready for play. Those were the days! My father also had a MacIntosh, one of the early ones, but he rarely let me touch it. He also had me learn some limited Basic Programming language when I was a teen. The language became outdated and I forgot most of it, but it would become the building blocks for my later career. By my mid-20s, when I was working as an Assistant Manager at a gas station and living with a roommate a dodgy apartment outside Atlanta, I got back into computers. By this time PCs had taken over, but I had never shed my Mac roots. This was in the early days of the PC explosion, and there weren’t exactly a lot of options for formal training. I took a break from my part-time college duties and did odd computer jobs on the side. These were mostly small projects. I became an official computer reseller, and would work with local distributors that would build them for me. My clients were generally older people who were trying to get a grasp on the new technology. I was a conduit for them, as I would get them a computer, install the operating system and software, and teach them how to use it. These were not the wealthy elite I was working with, so I hardly got rich, but it was good experience for me as an entrepreneur. My next dead-end job would be Kinko’s copies, where I met someone named Paul and later, Amanda. I started as a copy clerk, which did not work with me. After a time, I was transferred over to the Computer Services department where I would help people with computer rentals, something I had was already doing on the side. Later I got promoted to Document Creation Specialist. I would create all sorts of things for customers, such as flyers, business cards, invitations, brochures, and the like. Even though we had both PCs and Macs for rent, I did all of my work on a Mac using either Adobe PageMaker or Quark Xpress. Even though the job didn’t pay much, the experience was invaluable. I learned a ton about desktop publishing while there. As the Internet started becoming a global revolution, it inspired a personal revolution in me. I was intrigued, looking at all of these glorious web pages where you could learn so much. Many of the web pages looked spectacular. Many, or should I say most, looked like absolute junk. It was in the days at Kinkos that I started indirectly learning the building blocks about Web Development, although even then, most of this renaissance occurred on my own time. I bought a couple of books, learned HTML, Photoshop and some other tricks, and started to become pretty decent at creating pages. Even though I had a little bit of a creative streak, I would hardly call myself an artist. That’s where Paul and Amanda came in. Paul was a genius at illustration and graphics. I never had that artistic flair. He started dating Amanda, and she also had that same talent, and she also had video and graphics experience from her job at CNN. They got into Flash website creation, and had amazing talent. The stuff they were doing then was miles beyond what was on the Web at the time. We partnered and started building websites for people. The catalyst was that I got fired from the Kinko’s job for a dumb reason (and that’s another story). Needing to do something and not wanting to dive into a dead-end job again, I focused on my company, which was filed as a sole proprietorship. At first it was just me, and eventually Paul and Amanda worked with me on a consultant basis. We were basically kids and I had little experience running a business, so it was tough sledding most of the time. It seemed that everyone and their mother were trying to build websites for people. It was not easy finding clients, and the quality gap was monumental. We built good websites and charged a fair price, but others did shoddy, cheaper work. Most of my time was spent trying to figure out how to find new clients. We obtained a handful of good clients. I remember one was a company that manufactured a product that could detect moisture in buildings. They were terrific people, one of my favorite clients. We got another great client that was a trade association. We built their website, and they offered our services as a benefit to their member base to build websites. That didn’t really pan out. The largest project was for Ford Motor Company, where we worked with a local architect firm to build an internal website where dealerships could buy add-ons. That one turned out to be a disaster because the backend were Windows-based engineers with no design talent, and we were strictly design people. You would think we could have worked together and forged a partnership, but they never understood us. We built some amazing graphics for them (Paul especially! ), and they ended up chopping our work into something monstrous. Fortunately the world could not see that site. And we got paid. That always mattered. There was another client who was an absolute nightmare. She was a local artist who was pleasant when we first met her, but turned out to be a psychotic harpy. Paul and Amanda did the majority of the work on a custom Flash-based website, which for the mid-90s was revolutionary. Paul spent an inordinate amount of time putting it together. We had quoted our per-hour rate, but the artist had no idea how long it would take to do what she asked. We tried to tell her, and she simply didn’t listen. I remember when we unveiled the final site to her, which was without question amazing, groundbreaking work. When she saw it, she was unimpressed and said “Can you make a chirping bird fly through it?” That became an inside joke with us for years. Thanks to Paul, we did fly a bird through it, and it made a beautiful site look like a joke. But that’s what she wanted. The final bill ended up being a whopping $30,000. The bird probably cost $5,000. Her jaw fell to the floor when we tried to invoice her. We ended up getting paid $3,000 and were happy to get that. We could have sued, but we just wanted to move along and forget this lady. Because it was a struggle to obtain enough clients to generate a regular income, I took a job as Web Design Manager for a startup eCommerce company. Eventually I was able to hire Paul and Amanda as employees. That was a fun job and the salary was more than double my Kinko’s salary, plus I had some income from the side business. Around this time, frustrated from some of our more difficult client experiences, we decided to build websites of our own. What did we have that we could offer the world? Well, we were Web Developers in a world that barely knew how the Internet worked. Paul and I developed a complex design that had a news feed with rounded corners, something that was cutting edge back then and is cliché now. I created page after page of content, and that’s where I honed my writing skills. I spent days, months, years even, putting together pages that taught people how to make Web pages. The most popular was a lengthy HTML tutorial I wrote. There were other tutorials about programming, software, and design skills. Eventually we started doing product reviews and news alerts. A couple times we broke some news, and it was really something else watching the traffic flow in. It grew gradually and steadily, which was simply exciting. Later we added onto it, creating a network of sites including a forum community. All of a sudden, we had a miniature web empire, and people loved it. We learned how to monetize the traffic, but even though we had high numbers, it was not quite enough to live on. My full-time job was lucrative and giving me useful experience, but I was growing antsy. It was stagnant while my own properties were growing exponentially. I was spending my evenings and weekends doing nothing but work on the site. I grew unhappy with some of the office politics at the job, and made what was probably a bad decision. I quit. Sometimes you have to be bold. Sometimes you have to be stupid. I was both, and it worked out. A few months later, I learned that my friend Michael’s website about Internet Marketing and Search Engine Optimization had sold to a company in North Hollywood, California. He moved from the UK to live there. They gave him freedom to work on his site as a full-time employee, and he seemed to be happy. The entire network was in the top 200 web properties, which is impressive even for back then. I didn’t know the amount that he sold for, but I was intrigued. It seemed to be large enough for him to be happy. I remember calling them out of blue one day, and asking the receptionist who I would talk to about selling my company. He paused a long time, and transferred me to a 19-year old kid. That was the beginning of the end of my web career. Paul, Amanda and I flew back and forth to California to discuss the acquisition. It seemed like a wonderful gig. 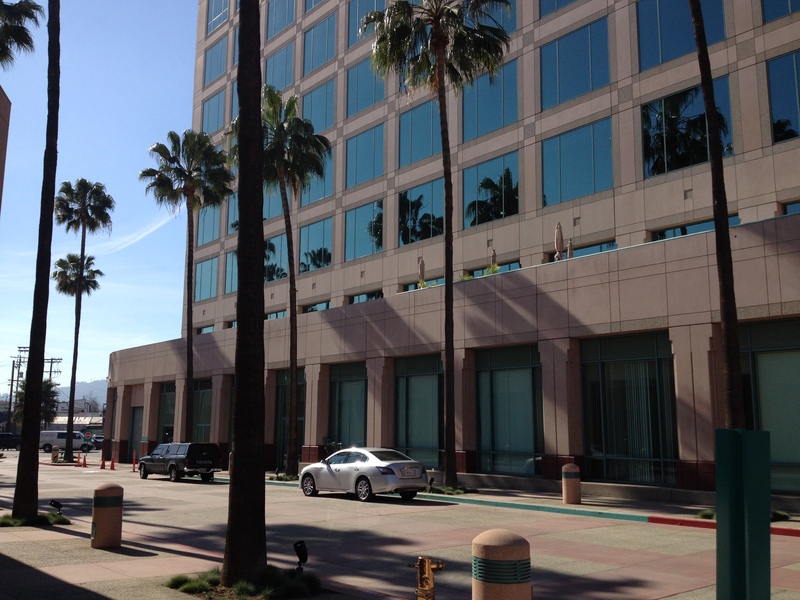 I met with other webmasters who had sold their company and worked in the offices. They were all completely happy. They encouraged me to do it. I got the offer. It was for a good sum of money that I will not disclose, a bunch of stock in the company, and a full-time job with the same salary I had made at the eCommerce company. The problem was there was no job for Paul or Amanda. We thought about it, and with their blessing, I signed the deal. I gave them some of the money from the acquisition and they bought a nice car with it. I bought a car and some other things. So, like the Beverly Hillbillies, I had struck oil and moved to Southern California. The next chapter of my life would be living the dream in North Hollywood. And that’s where Andrea and I visited earlier this year. A couple of years ago, my wife and I were casually walking along the downtown streets of Charleston. We stopped at a red light, waiting for it to turn before we crossed, when all of a sudden a cyclist comes from out of nowhere. We hear him coming and look back, and to our surprise, he ignores the light completely, rolls through it without even touching his brakes, and disappears out of sight. We looked at each other and both shook our heads. “Stupid Cyclists!” I said. And then it hit me that if I were thinking that way, what would someone who didn’t ride a bike think? I wouldn’t be so bold to do what this cyclist did, which was indeed stupid, but I have tapped my brakes and kept going through a stop sign if the coast was clear. I’ve done other things that people would frown upon or not understand. All of us have to a certain degree. 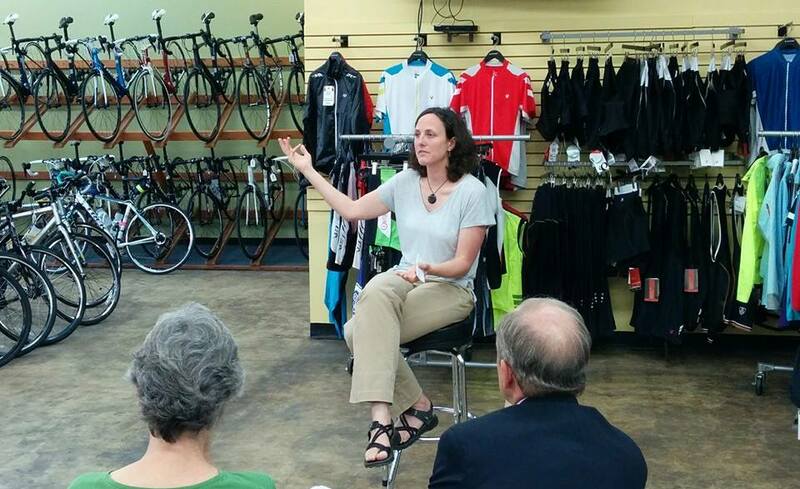 Last night I attended a function at Outspokin’ Bicycles where Amy Johnson from the Palmetto Cycling Coalition was speaking. I’ve mentioned them numerous times on this blog, and am a strong supporter of everything they do. The problem is, South Carolina is not Colorado, Oregon or California. Our legislators are not inclined to pass pro-cycling legislation, and it is through the efforts of people like Amy that have made an impact in the state. Amy used the term “Bike Lash” as a way of describing some of the recent antagonism towards cycling in the state. I’ve already talked about the ludicrous bill that Representative Nanney tried to pass. She wanted bikes to carry liability insurance and to get registered. What I didn’t know was her thought process for this absurd agenda. As it turns out, she was driving on a 4-line highway one day when she saw people hitting their brakes. Sudden stops can cause chain reactions and accidents, as cyclists know all too well. The culprit in this case, at least in the congresswoman’s eyes, was a cyclist that had been crossing traffic to try to make a left turn. When Representative Nanney saw this, she got the idea that they should carry liability insurance in case their actions caused an accident. They would be at fault. What Nanney didn’t consider was that it is already illegal to follow too close. We’ll never know whether the cyclist jumped into traffic. It is hard to think that someone would be that foolish, but I didn’t expect the Charleston rider to blatantly run the red light either. Whatever happened, any accidents that occurred would have been the fault of the driver that first rear ended a car. There was another bill proposed that didn’t get nearly the amount of attention, and actually came from a more benevolent place. A legislator wanted to ride on the sidewalk of a 55 mph 4-lane highway, but it was illegal due to a local ordinance. Sidewalk riding is permitted in most places in the state, yet some local governments may choose not to. It makes sense for downtown areas with a lot of foot traffic. We don’t want cyclists running into pedestrians. It doesn’t make sense when there’s a dangerous highway and no other alternative on where to ride. This gentleman tried to make it legal statewide to ride on the sidewalk. His mistake was that he wanted to make a sweeping change to address a local issue. Just like Nanney’s, his bill went nowhere. The “Bike Lash” is occurring because so much progress has been made. Greenville is one of the top cycling cities in the southeast. They have done an excellent job with their cycling infrastructure. Some people don’t get cycling, and think that they are footing the bill for this progress. A lot of nonsensical arguments are made, one of which is that cyclists don’t pay taxes. We do. Most of us have cars, houses, and we buy stuff just like everybody else. Don’t get me started on all the taxes that I pay. When a motorist sees somebody blow through a stop sign, stop light, or cross traffic to make a left, it gets them heated. As cyclists, we have to be conscious of how we present ourselves to the public. We have to be aware that there are other people using the roads that simply don’t like us. Following traffic laws is just a small part of what we can do. I try to be aware of when cars are behind me. If there are several that cannot pass, then sometimes I will stop and let them go by. Sure, I cannot stand it, but it makes a difference. When a car waits patiently to pass me and gives me a wide berth, I will acknowledge with a friendly wave as they pass, thanking them for their courtesy. Some may still curse me as they drive by, but some will momentarily think: ‘That cyclist was a nice guy. I’m glad I was patient with him.’ The little things make a difference. As tempting as it is to blow people up that disagree with us or simply don’t understand the realities of cycling, it is important to be civil yet assertive with the debate. Calling names does not help. People called Representative Nanney some names, and she probably was stunned by the response. Others spoke to her with respect and explained the flaws in her arguments. Hopefully she has come to a better understanding, and hopefully many more people will as well. We have to be aware that there will be people who will try to slow us down, literally and figuratively. We have to be prepared for it, yet also make a good impression and keep pushing for progress in our community. What I love about the modern age is that there are consequences for everything. If someone does something irresponsible or stupid enough to be noticed, chances are word will be spread and it will come back to haunt them. We’ve seen this numerous times with the cycling community. I’m sure everyone who reads this blog remembers the pummeling that Specialized took for harassing a local bike shop for using Roubaix in his products. After remaining silent for a few days, they inevitably apologized. Not too long ago, some Georgia lawmaker proposed licensing all bicycles in the state. The cycling community spoke up, and the bill was retracted promptly. The excuse, as you can see in this link, was that they wanted to start a discussion. Wendy Nanney, enter stage left. A congresswoman from Greenville proposed a bill to not only license bikes in South Carolina, but force them to get liability insurance. It was a preposterous suggestion, and as many have pointed out, would have never made it to a vote. Someone found the bill online and posted it to Facebook. Whoever made the discovery deserves a ton of credit for what followed. It spread like wildfire. I saw it posted to a friend’s feed, then it started being shared, and shared, and shared again. I posted it to the SteepClimbs Facebook page where it got a TON more traction than most of my posts. I’m not taking credit for it spreading around the internet, but I’m glad to have posted it to raise awareness. My post alone got 5,000 views, and that’s just the tip of the iceberg. On Sunday night, this story was all over my news feed. Representative Nanney has a Facebook page of her own. I wish I had screen-captured the first post she put up. Basically, it gave an overview of how a bill becomes a law, which shows me that she had at least watched the video below. I responded, thanking her for the government lesson, and asking if she could share the process of voting idiots that proposed ill-conceived legislation out of office. She deleted my comment as well as many others. Frankly, I don’t blame her. Today that post no longer exists. What’s amazing is that this congresswoman is from Greenville, which is one of the top cycling destinations in the southeast. Their Swamp Rabbit Trail is a model for urban cycling development. Greenville at one time hosted the US PRO Cycling Tournament, and holds plenty of other smaller tournaments. Her bill would have effectively banned anyone from out of the state from participating in any of these tournaments. I know firsthand how much revenue these events can generate. Her bill would lose the city millions, maybe tens of millions, in Greenville tourist revenue alone. 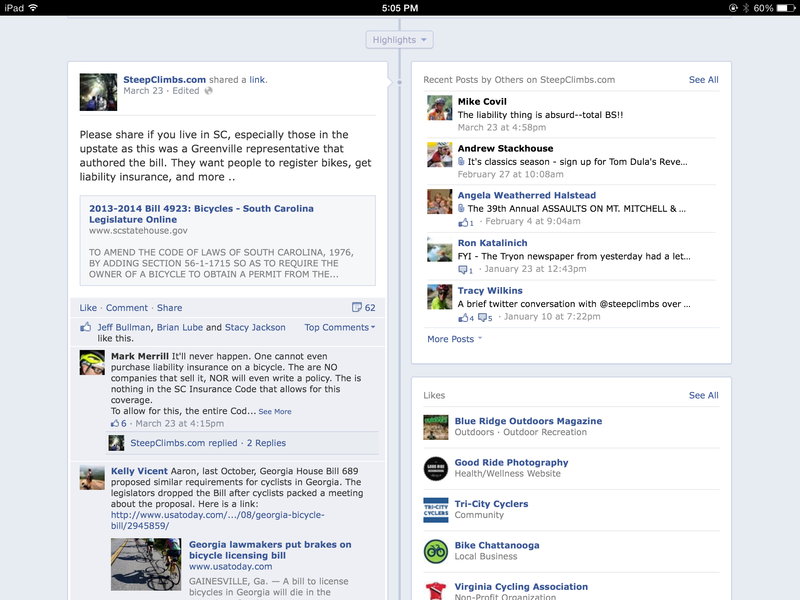 Lots of people ride bikes in Greenville and throughout South Carolina. I’ve met many of them. We don’t often talk about politics on the bike, but I happen to know that many of them are ultra conservative, many are ultra liberal, and many are smack dab in middle. I also know that they are a passionate bunch, and they all vote. This is the type of issue that could unite a whole host of people, and was a major misstep for the congresswoman. The saga concluded today with the retraction of the bike bill. She explained it eloquently in this Facebook post. I love those first few words, “After the overwhelming response from the cycling community, I have decided to drop the Bike Bill.” Again, she was just trying to start a discussion. We cannot take full responsibility. As it turns out, the Palmetto Cycling Coalition had learned of this bill a couple weeks ago and had been working behind the scenes to shut it down. I have no doubt that even without social media, they would have been successful. That said, it’s a terrific feeling to unite with thousands of people you’ve never met, yet share the same opinion, and together make things happen. The Cycling Community is a force to be reckoned with. We won again.